The Samsung Galaxy Note 5 will more than likely be introduced in two months at Berlin’s IFA conference. If you don’t care and would rather have last year’s Galaxy Note 4 at a discounted rate, then well, Samsung has a deal for you. 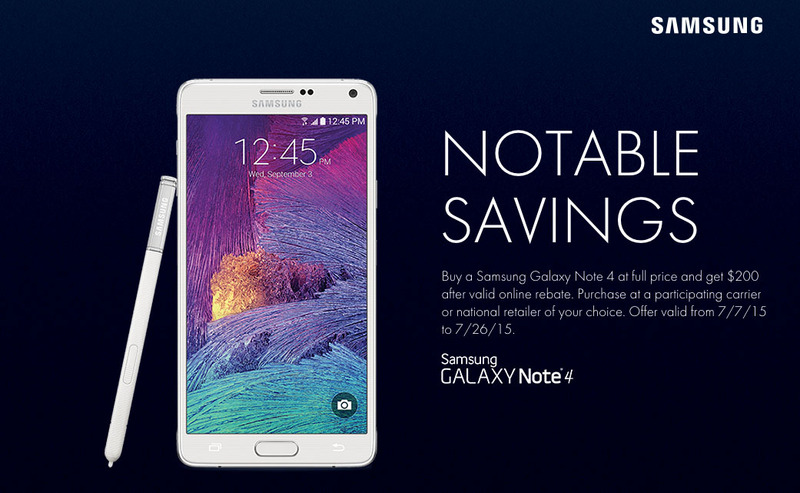 If you buy a Galaxy Note 4 between today and July 26 at full retail, they will send you a rebate check of $200. According to Samsung’s dedicated site for this promo, the deal does not include the Note 4 from Sprint or US Cellular, but that should mean that T-Mobile, Verizon, and AT&T models are fair game. As long as you buy the phone from a “participating carrier or national retailer of your choice,” you should qualify for the $200. Of course, we can’t find a list of who those carriers and retailers are, so you’ll need to check with potential retailers before diving in. At the link below, you can submit your information to get the ball rolling on your rebate post-purchase. Samsung says it should take about 8 weeks for your $200 check to ship. That’s not a bad deal. For example at Verizon, you would spend $699, but then receive $200 in the form of a check. $499 for a Note 4 is a good price.